Manchester United manager Sir Alex Ferguson barely savoured winning his 11th Premier League title before targeting a fourth consecutive triumph. The 0-0 draw with Arsenal gave United their 18th league crown, and equalled the record of rivals Liverpool, but the Scot is already hungry for more glory. "A 19th league title would give us a special place in the club's history." 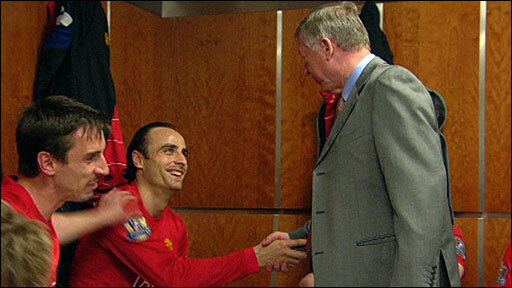 Ferguson added: "I am already thinking about next year. You have to do it here. There is nothing else for it. You just drive on. 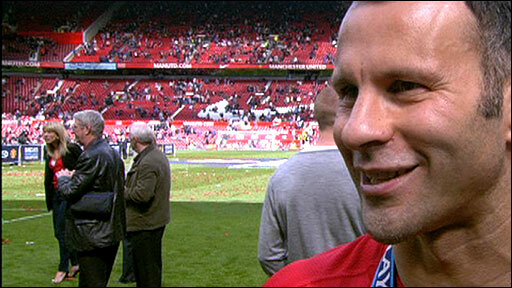 "I do take a lot of pride from equalling Liverpool. When I came down here they were the top guns. My job was to try to change that. "I never thought we could get 11 titles - never in a million years." But before the 67-year-old can start to mastermind another league campaign, he will lead his team out in Rome in 10 days for the Champions League final against Barcelona. And Ferguson feels his side could not be in better health as they aim to become the first team to successfully defend Europe's premier cup in the Champions League era. "The players and fans are up. It is a very positive note we are striking at the moment. "You get that same wonderful feeling when you win a trophy. "When you see the fans celebrating at the end of the game, all the hard work and the pain is worth it." 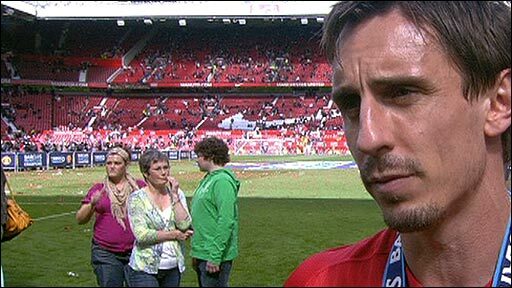 Club captain Gary Neville believes the quality and depth of the squad has been the key to this season's success. He said: "The thing about us this season is you can't name our best side. "It has been about our squad, and everybody has contributed - whether they have played enough games to win a medal or not. "Liverpool have finished in title-winning form but we have not panicked, we have fought hard and had to show some guts to win it this time." Striker Wayne Rooney admitted it was important that United prevented the need to get something from their last league match at Hull. "It was very important to wrap it up now, so we can prepare for the Champions League final and give the manager the option to rest players. "It is amazing to have won three titles in a row, it is a great feeling. Liverpool pushed us all the way, has been a great season." 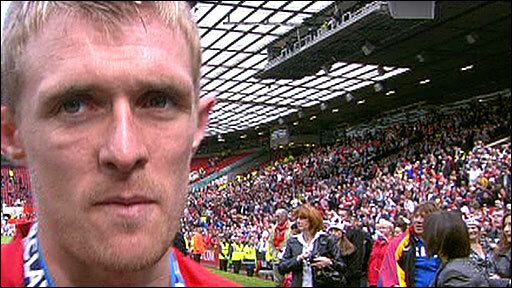 It was only the second time United have won the title on home turf, and midfielder Darren Fletcher said it added to the occasion. "It's unbelievable. You don't get used to it. Winning a trophy is a special thing," said the Scot. "To do it at home is more special, it's nice to win it here." 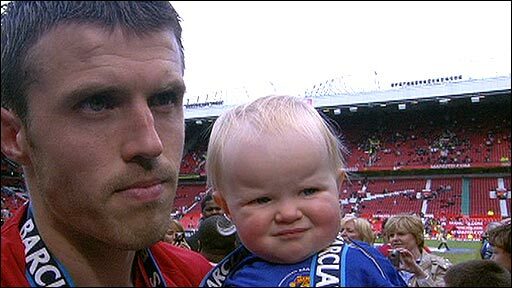 Fletcher's sentiments were echoed by Ryan Giggs, who knows more about winning trophies than any other current United player, having been a part of all the club's Premier League successes. 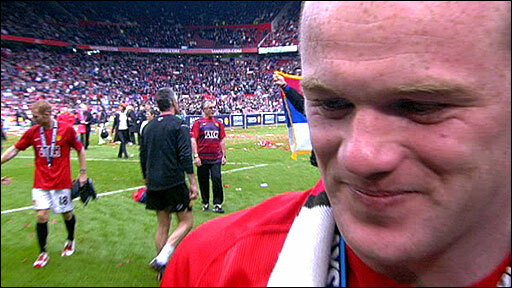 "To win the title again gives me great satisfaction," he told BBC Radio Five Live. "I'm fortunate to play with so many great players. "This is great because we have done it in front of our own fans. "It was a tense game but then came the relief and enjoyment - after all the hard work that you put in through the season this makes it all worthwhile. "Each year we're challenging. We give ourselves a chance and we've finished it off today. "We will enjoy today and tonight. And next week on Monday and Tuesday we will start getting ready for Barcelona. "Of course we have got Hull first but now we've won the league, Barca will be the one we will be preparing for." Hoping to join him on the pitch face the Spanish giants will be defender Rio Ferdinand, who missed the match against Arsenal because of a calf injury. Ferdinand, who is expected to be fit to play in the Rome showpiece, revealed it was hard to watch from the Old Trafford sidelines. "I'm not a great watcher of game as it is, and I was devastated not to be playing. But to win it like this, at home in front of all our fans is what you dream of. "There are not many teams who have won three in a row and to be part of a team that does that is an unbelievable feeling really. "The resolve we showed to win the title speaks volumes about the players in the side. "We are just enjoying the moment and we have got a massive game against Barcelona coming up to look forward to."